These are the nametags for the pilots for VF-102. These are the nametags for the RIOs for VF-102. This is the desert version of the nametag for the pilots for VF-102. The VF-102 "Diamondbacks" are located at NAS Oceana, VA and fly the F-14A Tomcat. They were established in July 1955, and transitioned from the F-4J Phantom to the F-14A Tomcat in July 1981. This is their Operation Enduring Freedom patch, and will also be their last Tomcat cruise, as they are transitioning to the F/A-18 Hornet when they return. The VF-102 "Diamondbacks" were located at NAS Oceana, VA and flew the F-14A Tomcat. They were established in July 1955, and transitioned from the F-4J Phantom to the F-14A Tomcat in July 1981. During operations against Libya in 1986, they were fired upon by SA-5 SAM Systems. They also participated in Operation Desert Storm. and were attached to CVW-1 onboard the USS John F. Kennedy. The VFA-102 "Diamondbacks" are located at NAS Lemoore, CA and fly the F/A-18 Hornet. They were established in July 1955, and transitioned from the F-4J Phantom to the F-14A Tomcat in July 1981 then to the F-18 Hornet in 2002. During operations against Libya in 1986, they were fired upon by SA-5 SAM Systems. They also participated in Operation Desert Storm. They currently are attached to CVW-1 onboard the USS John F. Kennedy. The VF-102 "Diamondbacks" are located at NAS Oceana, VA and fly the F-14A Tomcat. They were established in July 1955, and transitioned from the F-4J Phantom to the F-14A Tomcat in July 1981. They lead in operations against Libya in 1986 and participated in Operation Desert Storm. This is the desert version of the squadron patch they wore while on cruise. The VF-102 "Diamondbacks" are located at NAS Oceana, VA and flew the F-14A Tomcat. This is the "hexagonal-shaped" patch of their 1995 Clifton Grand Slam patch created when they won the coveted award. The VF-102 "Diamondbacks" are located at NAS Oceana, VA and flew the F-14A Tomcat. This is the "shield-shaped" patch of their 1995 Clifton Grand Slam patch created when they won the coveted award. The VF-102 "Diamondbacks" are located at NAS Oceana, VA and flew the F-14A Tomcat. This is the patch that they came out with when they upgraded their Tomcats from the A-models to the B+. The VF-102 "Diamondbacks" are located at NAS Oceana, VA and fly the F-14A Tomcat. This is the aircraft patch worn on the right sleeve of the flight suit by most VF-102 Tomcat drivers and RIOs. The VF-102 "Diamondbacks" are located at NAS Oceana, VA and fly the F-14A Tomcat. 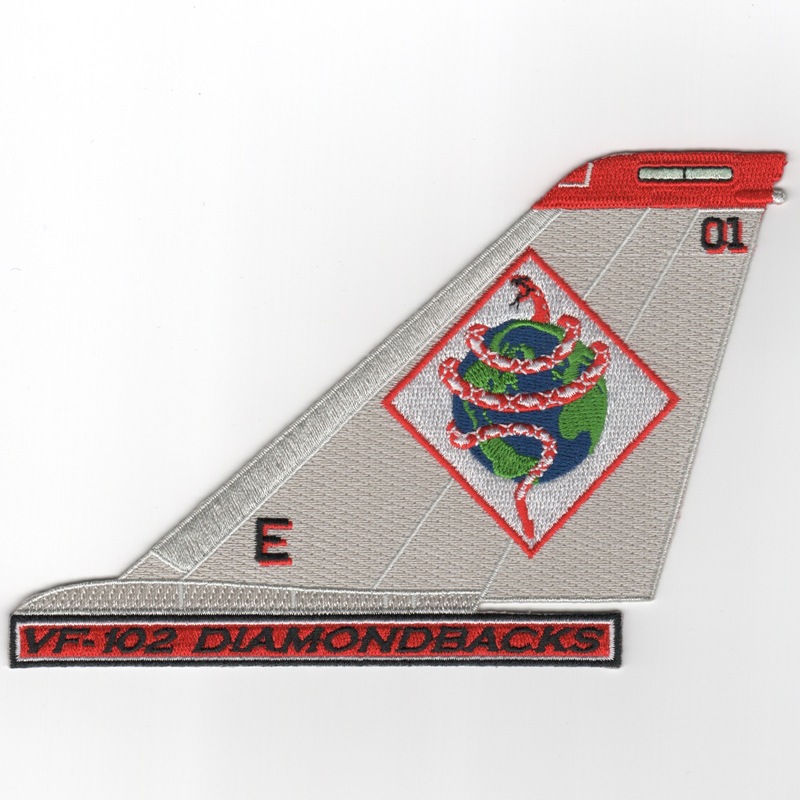 This is the desert version of the aircraft patch worn on the right sleeve of the flight suit by most VF-102 Tomcat drivers and RIOs while deployed. The VF-102 "Diamondbacks" were located at NAS Oceana, VA and fly the F-14A Tomcat. This is the patch given out for their award of the "Golden Wrench" in 1996 to their maintainers, some of the hardest working guys I have ever seen. The VF-102 "Diamondbacks" were located at NAS Oceana, VA and flew the F-14A Tomcat. This is the patch they created for their "decommissioning" of the Tomcat and the transition to the F/A-18 Hornet. 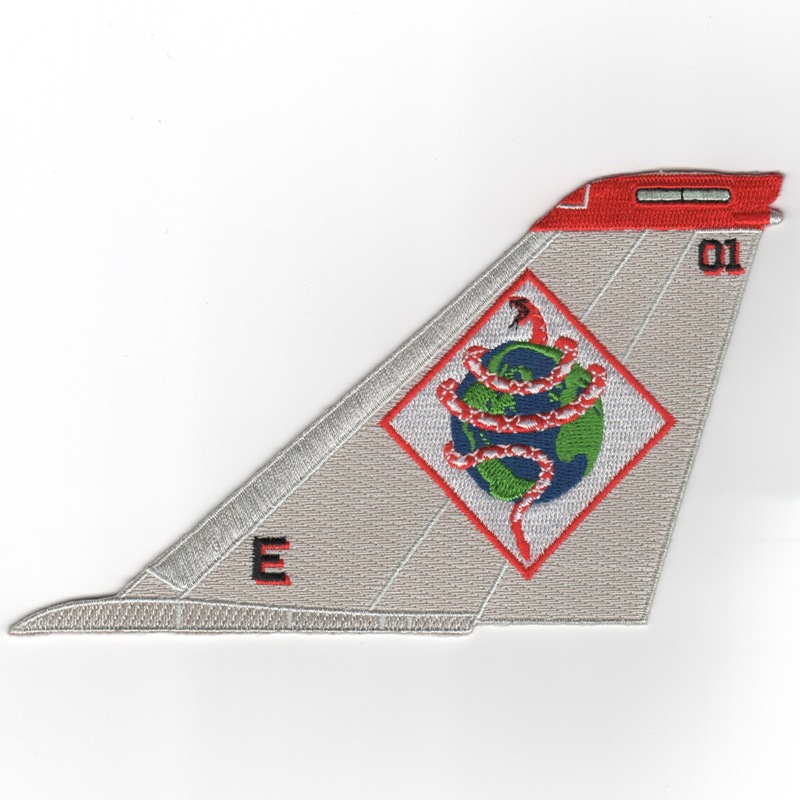 Homepage | Order VF-102 Patches!